JOWAR – Also known as (Sorghum) and is part of the White Millet family. Jowar/Sorghum flour is used to make roti a flat bread that goes well with many Indian dishes or Indian curry. 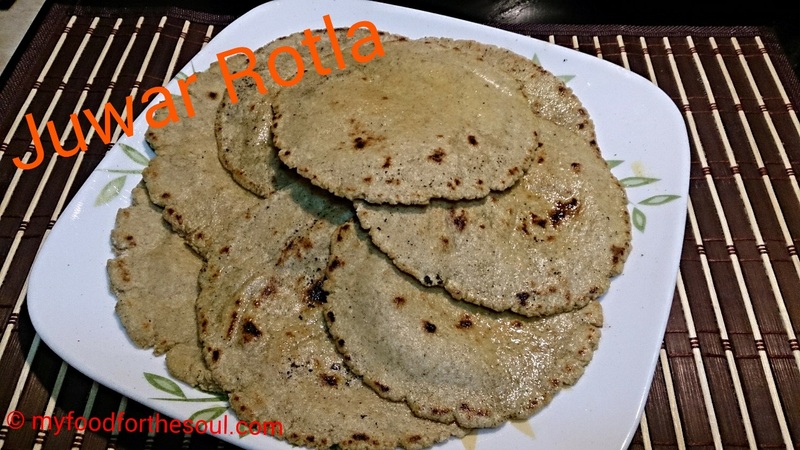 Jowar Rotla are gluten-free flat bread, which is an excellent source of nutrition for everyone but especially for people with gluten tolerance. Jowar/Sorghum has a high content of Calcium and is also packed with Iron, Protein and Fiber. I won’t say that jowar roti (flat bread) is the easiest roti to make because since jowar is gluten-free flour so it is a bit more difficult to pat or roll a thin roti out of it. They then to break in between but it only take’s practice, patience and following the steps to master making Jowar Rotla. From my own experience making these ….it is time-consuming and will take a lot of practice but like I say nothing is impossible. I had learned how to make it from my mother and she is an expert at this so in no time she was able to pat out thin Jowar rotla and cook them. These Rotlas go great with any curry whether it’s North Indian, Maharashtrian or Gujarati vegetable or legumes curry. It also goes well with just a simple pickle (achar). These Rotlas taste great and are healthy ! So, let me show you how to make Jowar Rotla and please also read the additional notes below the recipe for tips on how to help you make these rotlas without any complications. In a shallow wide pan, take the flour and mix salt. Keep it ready to mix water. Take half the flour and add hot water into the dough little by little and using a spatula keep incorporating flour and hot water to form a soft dough. Repeat this step with the other part of the flour. Leave it for about 5 minutes so that you can handle the flour (don’t let to become cold). After 5 minutes knead the dough nicely until it is soft and non-sticky. Sprinkle little hot water if required. The final dough should be soft and non-sticky. Kneading well is very important part of making this roti else they will break while rolling. Make small orange sized balls. In the authentic old fashion way, these balls are dusted and later patted with palm to make big thin roti’s. This method requires lots of practice. So for the beginners, easy method is rolling the dough using a rolling pin. Take a large piece of wax or parchment paper fold in half now dust one side of the paper with dry jowar flour place flatten ball and dust again with dry flour folder over the other side of paper and press lightly and start rolling gently. In between rolling keep dusting if necessary until reached desired size. Be careful not to put pressure else it may break. Heat a tawa. Once tawa is hot open up wax paper and slowly take rolled roti out by placing one hand on the jowar roti and the other hand holding the wax paper and turn over and put it on the hot Tawa. Cook for 30 seconds. Next, with a small clean muslin cloth apply a thin layer of water on the upper surface of the roti. Let the roti remain so till water evaporates and you can observe small bubbles. At this stage, flip it and cook for a minute. Then press edges lightly with a soft dry cloth so that roti inflates. This also ensures equal cooking. Next flip the roti and put on direct flame if using gas stove otherwise use a wire rack as we do for roti. Roti puffs up quickly flip using tongs and cook other side for few seconds. Remove from flame. Brush it with ghee/butter if you wish. Continue the same process with the remaining dough. Since Jowar is gluten free, flour has to be fresh to make these rotis. With the old stock flour, roti making process might be difficult. Addition of hot water is a very important .As there is no gluten, hot water makes jowar flour adds stickiness. Don’t allow the flour + hot water to get too cold while kneading. Knead it when it is manageable hot. Kneading process is very vital. If the dough is kneaded well then it is easier to roll. Unlike other rotis, this roti dough needs no settling time. The rotis need to be made right away else you might have difficulty rolling them out later. They will dry up faster so make dough only in small quantities in case you are planning to make a small batch now and rest of the rotis later. While rolling, if the edges crack, smoothen the edges with fingertip and continue rolling to get smooth edges. Wiping roti with wet cloth removes extra dry flour from the surface and prevents roti becoming too dry.